The time you spend with your breeder is one of the most important parts of purchasing a hedgehog. An experienced and knowledgeable breeder will give new owners a great deal of handling and care advice. A good breeder’s handling demonstration, and the new owner’s practice with the hedgehog, are keys to the new owner’s success. Learning to handle a hedgehog is comparable to learning to ride a bike. Personal instruction and practice are much better than watching a video or reading a book, and will have significantly greater results. Gift certificate – many breeders will create a gift certificate that can be redeemed by the recipient for a hedgehog. Cage – a wrapped cage and/or accessories can be a great surprise for the expectant hedgehog owner. Stuffed animal – cute stuffed animal hedgehogs are excellent temporary substitutions of the real thing! Mystery Ride – some hedgehog owners-to-be may enjoy the thrill of a mystery ride to pick up their new pet. 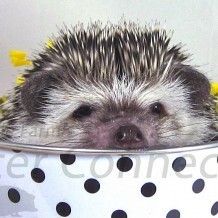 There are many things to consider when purchasing a hedgehog as a gift for a child. We strongly encourage you to read our article Pets for Youth and Children before consider a hedgehog as a gift to this age group. The opportunity to select a hedgehog based on its personality is a wonderful experience. We encourage you to take advantage of this option, if it is available.